Alternative names: hump on the back of the neck, dorsocervical fat pad, interscapular fat hump, Buffalo Hump, menopausal hump, local lipodystrophy, widow hump, etc. Objective - to reveal the main mechanisms of formation of the Buffalo Hump and develop effective non-invasive methods of treatment. According to the widely accepted belief, *Buffalo Hump* is an excessive accumulation of dense adipose tissue in the area where the neck meets the top of the thoracic region of the spine. 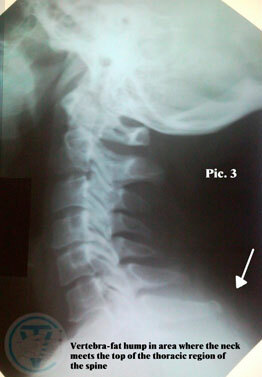 However, the condition of the spine (e.g. the presence of degenerative processes and the changing of its configuration) is not taken into the account. 1. Degenerative-dystrophic violations of the spine and surrounding tissue, mainly in the cervical-thoracic region with the dislocated vertebras (С6-Т4). Thus, a local outward curvature (kyphoscoliosis) forms. 2. Localised collection of density adipose tissue. These two components are the terms of the problem formation. These two components are the terms of the problem formation. The role of vertebral dislocation, the problem zone in the literature, is not sufficiently covered. At the same time, understanding of the pathomorphology of disease is important for the selection of the correct treatment tactics. To date, according to the prevailing notions about the disease, liposuction (removal of adipose tissue) is the most common procedure. Displacement of the vertebras may cause headaches, unstable blood pressure, dizziness, limited movement of the neck and numbness in the finges. The ^Buffalo Hump^ is slightly more often found in women. 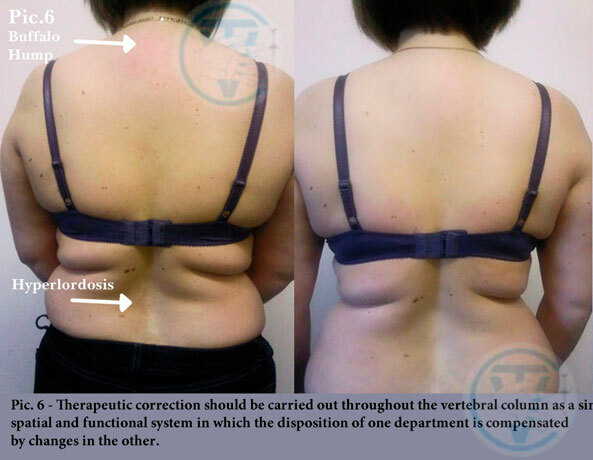 The appearance of the fat pad on the visible part of the back is perceived by the patients as a general physical inferiority and can cause them feeling down and even depressed. To cover up the fatty hump, many women feel forced to wear high neck clothes. 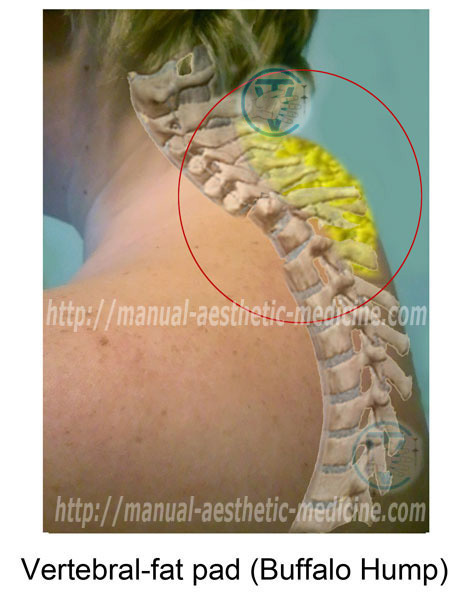 The disposition of the vertebrae in the cervical-thoracic junction may contribute to headaches, unstable blood pressure, dizziness, limited mobility of the neck, and numbness of arms. The Buffalo hump is slightly more often found in women. The appearance of the fat pouch on the revealed part of the spine is perceived by them as a general physical disorder and may cause depression. To cover the fatty hump, many women wear closed clothes. Vertebral-fat pad (Buffalo hump) is commonly found in adults ranging from normal weight to obesity. - Osteochondrosis, long term use of certain medications e.g. steroid hormones, medications used in the treatment of HIV, etc.Excessive accumulation of fat (resulting in obesity). Sometimes Buffalo Hump can be a sign of a different physical disorder, such as a hormonal imbalance, adrenal gland disease, etc. Heredity also plays a part in it. In some cases, the cause of the hump cannot be identified. There is also a possibility that the pathology in question is, in fact, a рrotective-adaptive reaction of body. The exact cause or mechanism of Buffalo hump is not entirely clear. Lack of knowledge about the nature of the disease makes it difficult to cure. The majority of the surgeons do not take into account the changes in the configuration of the spine before considering the type of treatment. The therapy is reduced to the liposuction only. However, this approach does not provide a radical treatment, and after surgical intervention, relapses are often observed. Additionally, the operation itself can induce accumulation of adipose tissue in other areas of the body. Other side effects and complications of surgery include postoperative scarring and irregularities on the surface of the skin, infections. Surgical treatment is advisable only if there are large adipose tissue deposits. Our experience shows that the treatment should start with the reposition of vertebrae in the problem area. When conducting Manual Therapy, it is important to take into account the structural features of the spine at the level of the lower part of neck and upper-thoracic spine (C6-T4). The mobility of the vertebrae at this level is significantly limited due to the presence of fixing joints between the transverse outgrowths of the vertebrae and rib arcs, thus Manual Therapy techniques applied by a specialist are important. We have developed a Manual Therapy technique, which allows eliminating the intervertebral blocks to restore the physiological position of the vertebrae and improve the condition of the surrounding tissues. In severe cases, it is possible to significantly reduce manifestations of the *Buffalo Hump*. Therapeutic correction should be carried out throughout the vertebral column as a single spatial and functional system, in which the disposition of one section is compensated by changes in another. Positive dynamics are observed after the first Manual Therapy procedures. After repositioning of the vertebrae, in the problematic area, a dense adipose tissue becomes soft. Underweight people usually have an elastic skin-fat pouch left after the therapy. The residual formation is removed by using a combination of lipolytic drugs which are used in Aesthetic Medicine to dissolve fat cells. 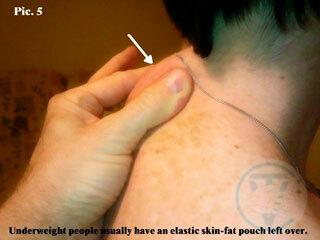 Pic.5 - Underweight people usually have an elastic skin-fat pouch left over. In our practice, we use products, which have effective fat dissolving qualities and inject them into the skin-and-fat pouch that was left after the correction of the spine. Drugs are administered in subcutaneous fat by Mesotherapy or ionophoresis. The outcome of Mesotherapy is a gradual dissolving of fat cells, caused by the components in the remedy. These products are then removed through the excretory organs. Furthermore, modern lipolytic agents have the ability to return the tone and skin elasticity while having no side effects. If it is necessary, supplementary medications are prescribed to improve the endocrine glands and gastrointestinal tract functions. Selection of drugs is individualised. The duration of treatment depends on the size of the accumulated fatty tissue, the degree of degenerative changes in the cervical-thoracic spine, the presence of inflammation, and the comorbidity of the medical conditions. It could total from 1.5 to 2 months. Depending on the patient, the procedure can range from painless to low amounts of pain; it is well accepted and has no complications or side effects. After Mesotherapy, some swelling and small bruises can appear, but they will disappear within 2-3 days. To prevent recurrence, a complex of therapeutic measures is advised to be re-administered. The earlier the treatment started the better the result. - Serious disorders in the cardio-vascular system. - Continuous intake of medications that provoke Buffalo Hump. To further prove our point of view, we have supplied a photo of a young woman that has a disposition of the vertebrae between the lower neck and upper chest area of the spine. Currently, there are no signs of the adipose tissue development. This situation we called pre - lipodystrophy, or pre-Buffalo Hump. The proposed therapeutic approach allows affecting some parts of pathogenetic chain and gives a good clinical and cosmetic result; it does not preclude the search for the cause of the problem (Buffalo Hump Factor) and it’s successful elimination. The combined use of Manual Therapy and Aesthetic Medicine (Manual-Aesthetic Medicine) in many cases allows to successfully carry out correction treatment of the patient’s problematic figure without surgical procedures and with no complications. Lo JC, Mulligan K, Tai VW, Algren H, Schambelan M. `Buffalo hump’ in men with HIV-1 infection.Lancet 1998, 351: 867 –870. Wajchenberg BL. Subcutaneous and visceral adipose tissue: their relation to the metabolic syndrome. Endocr Rev2000; 21: 697–738. Westerbacka J, Yki-Jarvinen H, Vehkavaara S, Hakkinen AM, Andrew R, Wake DJ, et al. Body fat distribution and cortisol metabolism in healthy men: enhanced 5 beta-reductase and lower cortisol/cortisone metabolite ratios in men with fatty liver. J Clin Endocrinol Metab 2003; 88: 4924–4931. Rodriguez de la Concepcion ML, Domingo JC, Domingo P, Giralt M, Villarroya F. Uncoupling protein 1 gene expression implicates brown adipocytes in highly active antiretroviral therapy-associated lipomatosis. AIDS. 2004;18:959–960. Mallon PW, Wand H, Law M, Miller J, Cooper DA, Carr A. HIV Lipodystrophy Case Definition Study; Australian Lipodystrophy Prevalence Survey Investigators. Buffalo hump seen in HIV-associated lipodystrophy is associated with hyperinsulinemia but not dyslipidemia. J Acquir Immune Defic Syndr. 2005;38:156–162. Palella FJ Jr, Chmiel JS, Riddler SA, Calhoun B, Dobs A, Visscher B, Kingsley L. A novel pattern of lipoaccumulation in HIV-infected men. JAMA. 2006;296:766–768. doi: 10.1001/jama.296.7.766. Palacios R et al. Cervical lipomatosis in HIV-infected patients: a case control study. HIV Med 8: 17 – 21, 2007.